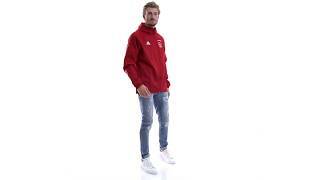 Ajax adidas rain-jacket for players during season 2018-2019. This rain-jacket is part of the official home collection for season 2018-2019. In this jacket you are ready for rainy weather conditions. The jacket has a packable hood and is made of a water-repellent fabric. The rain jacket is worn by the Ajax selection during training on de Toemkomst.